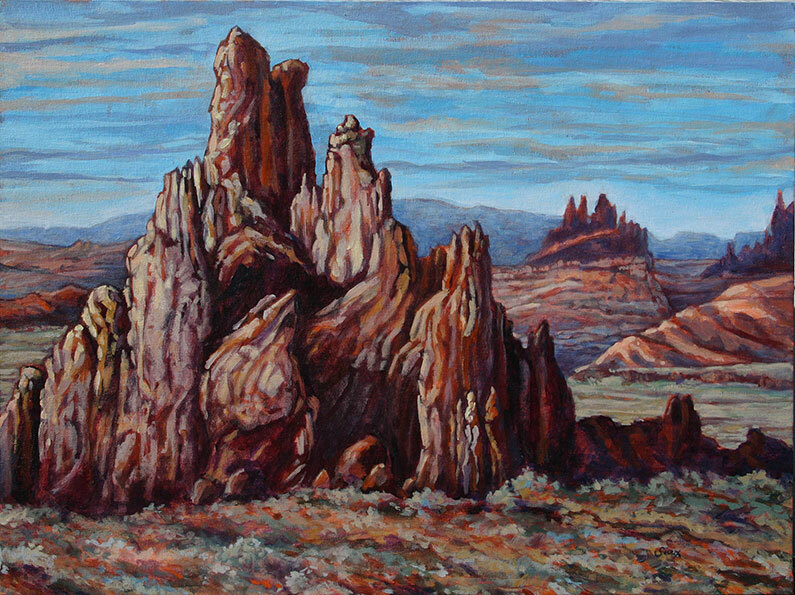 Long overdue, I bring you the completed painting of "Desert Cathedral", a sideways view of the iconic Church Rock that lives on the Navaho reservation along Highway 160. I finished this piece a few weeks ago, but hadn't taken the time to share it with you. If you remember waaaaay back to my last post, I was inspired by paintings that began with a coat of rusty red that still shone through in the final paintings. You have to look hard to see any of that color in this piece, but it certainly was a fun way to begin a painting. 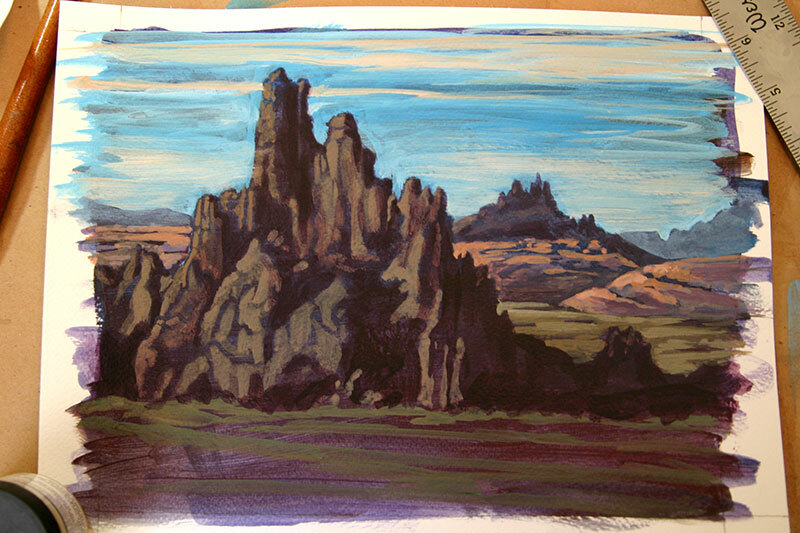 Working on this took me back to that broad expanse of dramatic desert, tinted gold and orange by the late fall sun. It's a magical place and although the ride across the Res is long, it is rich with beauty and mystery, and it awakens something spiritual inside me. I started another painting of the same subject on paper, only starting with a deep-toned blend of purple and brown as my base. With this piece, I am painting the light back into the scene--a very different approach than starting with a mid-tone. This is still early on in its development, so we'll see how it comes out. But there is light at the end of the tunnel (figuratively) and I'm finding my way back to the studio by way of my sewing machine. 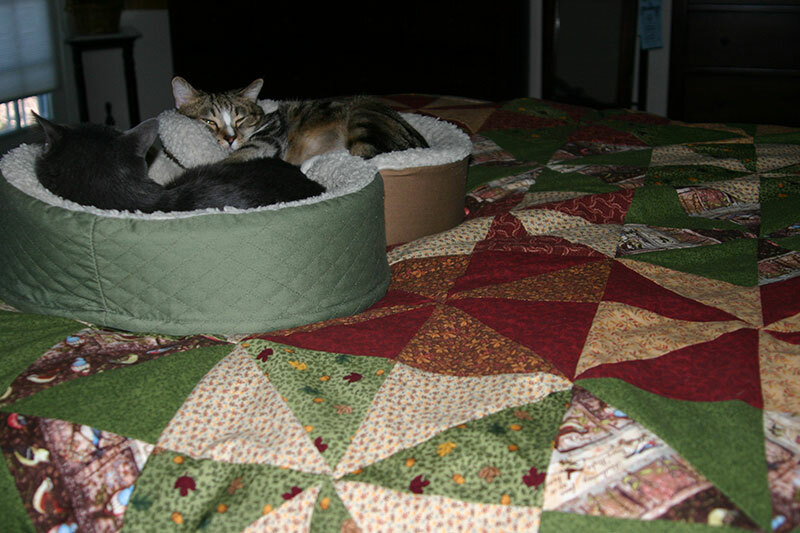 Not quite ready to paint, I became focused on finishing a quilted cover for a down comforter I started last year during a long stretch of snow. In a frenzy, I finished it, and it has kept us nice and warm since. and around us on top of the warm down. A few days ago, I started another quilt. I'd been thinking about this one for a while. 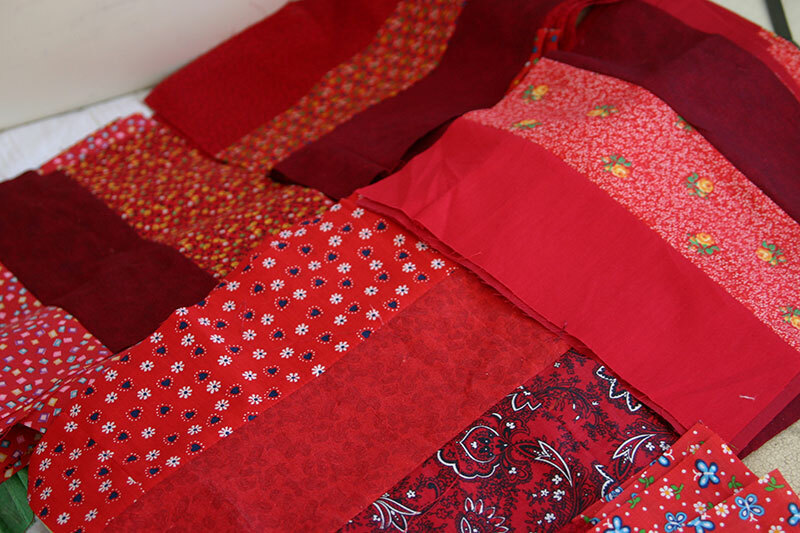 I'm making it from my grandmother's fabric stash—just the red fabrics—because her birthday was on February 14th and it seemed so right to do this now. It may take me a while—and it's quite likely I'll return to painting before I complete this new project. But for now, the smell of the old fabrics and the rhythm of the sewing machine provide comfort and creativity. As you can see by this post, I've returned to tell you about my art, so I know that returning to the studio is not far behind.